Using the Hubble and Spitzer Space Telescopes, astronomers have discovered Eta Carinae “twins” in other galaxies that will help scientists better understand this brief phase in the life of a massive star. Eta Carinae, the most luminous and massive stellar system within 10,000 light-years, is best known for an enormous eruption seen in the mid-19th century that hurled at least 10 times the sun’s mass into space. This expanding veil of gas and dust, which still shrouds Eta Carinae, makes it the only object of its kind known in our galaxy. Now a study using archival data from NASA’s Spitzer and Hubble space telescopes has found five objects with similar properties in other galaxies for the first time. “The most massive stars are always rare, but they have tremendous impact on the chemical and physical evolution of their host galaxy,” said lead scientist Rubab Khan, a postdoctoral researcher at NASA’s Goddard Space Flight Center in Greenbelt, Maryland. These stars produce and distribute large amounts of the chemical elements vital to life and eventually explode as supernovae. Located about 7,500 light-years away in the southern constellation of Carina, Eta Carinae outshines our sun by 5 million times. The binary system consists of two massive stars in a tight 5.5-year orbit. Astronomers estimate that the more massive star has about 90 times the sun’s mass, while the smaller companion may exceed 30 solar masses. 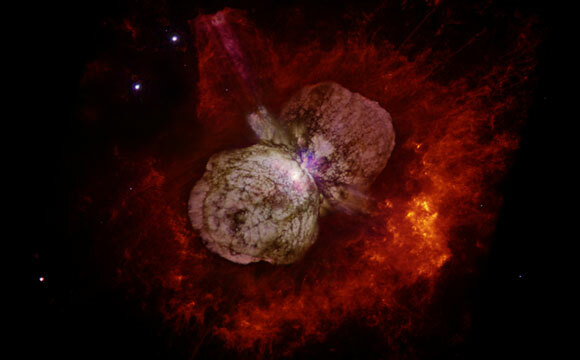 As one of the nearest laboratories for studying high-mass stars, Eta Carinae has been a unique astronomical touchstone since its eruption in the 1840s. To understand why the eruption occurred and how it relates to the evolution of massive stars, astronomers needed additional examples. Catching rare stars during the short-lived aftermath of a major outburst approaches needle-and-haystack levels of difficulty, and nothing matching Eta Carinae had been found prior to Khan’s study. Working with Scott Adams and Christopher Kochanek at Ohio State and George Sonneborn at Goddard, Khan developed a kind of optical and infrared fingerprint for identifying possible Eta Carinae twins, or “Eta twins” for short. An initial survey of seven galaxies from 2012 to 2014 didn’t turn up any Eta twins, underscoring their rarity. It did, however, identify a class of less massive and less luminous stars of scientific interest, demonstrating the search was sensitive enough to find Eta Carinae-like stars had they been present. 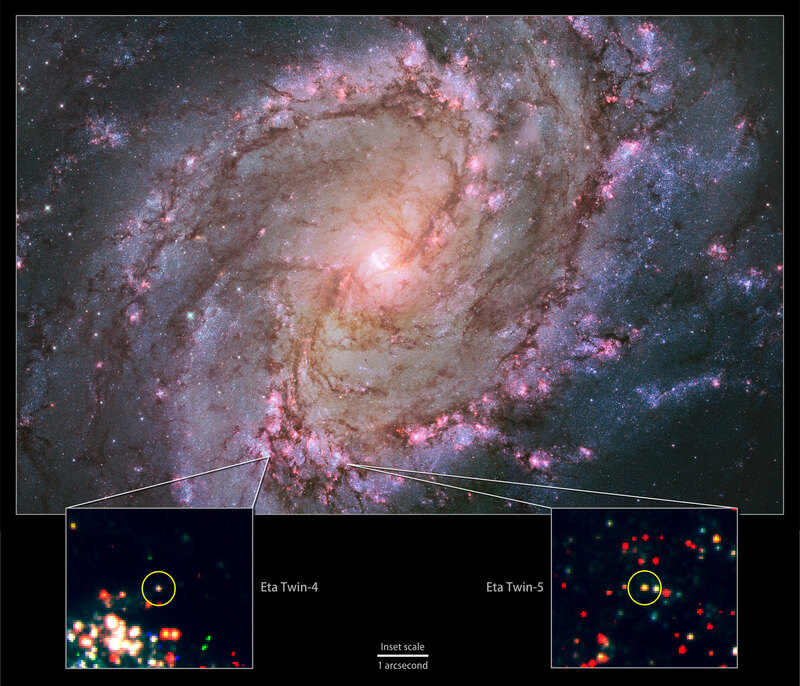 In a follow-on survey in 2015, the team found two candidate Eta twins in the galaxy M83, located 15 million light-years away, and one each in NGC 6946, M101 and M51, located between 18 and 26 million light-years away. These five objects mimic the optical and infrared properties of Eta Carinae, indicating that each very likely contains a high mass star buried in five to 10 solar masses of gas and dust. Further study will let astronomers more precisely determine their physical properties. The findings were published in the December 20 edition of The Astrophysical Journal Letters. NASA’s James Webb Space Telescope, set to launch in late 2018, carries an instrument ideally suited for further study of these stars. The Mid-Infrared Instrument (MIRI) has 10 times the angular resolution of instruments aboard Spitzer and is most sensitive at the wavelengths where Eta twins shine brightest. “Combined with Webb’s larger primary mirror, MIRI will enable astronomers to better study these rare stellar laboratories and to find additional sources in this fascinating phase of stellar evolution,” said Sonneborn, NASA’s project scientist for Webb telescope operations. It will take Webb observations to confirm the Eta twins as true relatives of Eta Carinae. 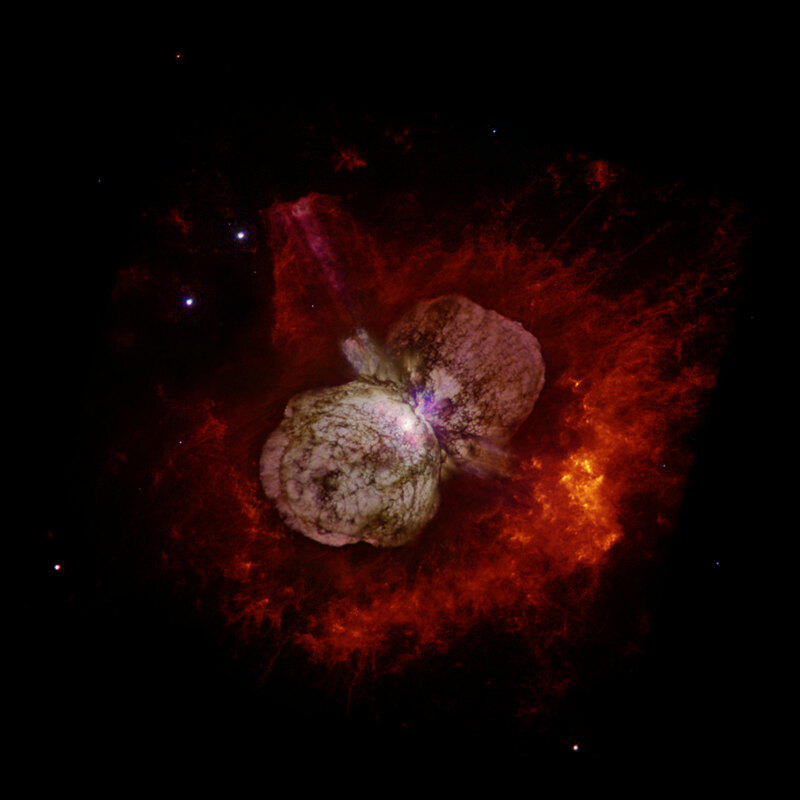 Be the first to comment on "Astronomers Discover “Twins” of Eta Carinae in Other Galaxies"